We completed seven busy days at the clinic set up in the local elementary school in the community of Paraiso, about a 45 minute chaotic drive from our hostel in Santo Domingo. We were 3 attendings, two residents and four medical students, plus we had some helpful local and student translators. Each day we would see about 100 patients. We saw all ages, from babies to seniors. Seems like all patients complained of the "gripe" which is similar to our common cold type symptoms. We saw acute infections: ear infections, skin infections, upper respiratory infections. We treated almost everyone for parasites. A lot of children had skin rashes including tinea capitus and tinea versicolor. Many of the women had vaginal complaints. There was also a high incidence of gastritis in both men and women. At the well child visits we gave children toothbrushes. We saw some common chronic diseases such as hypertension and diabetes. We were able to give patients a three-month supply of the most common anti-hypertensive drugs, to keep their blood pressure under control until the next team visits. We also conducted a health survey and had the opportunity to visit families in their homes, in the most impoverished section of Paraiso. . Most people lived in small concrete, tin or wood structures, with no running water or electricity. People were always quite gracious, and kindly answered our survey questions about water supply, diarrhea and parasites. We measured the height, weight and arm circumference of the children aged five and under. The project was well organized, thanks to the efforts of our team leader, Dr. Thomas Ball. The students and residents were enthusiastic and fun to work with. 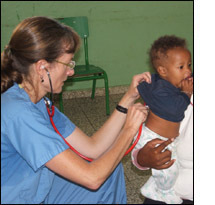 Thank you for your generous support in this project sponsored by the Dominican Aid Society of Virginia.